Welcome to my website – I honestly hope you have found this page through search. 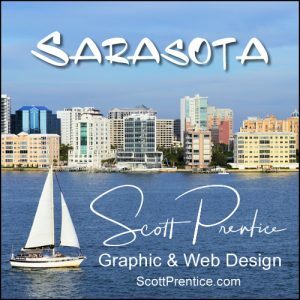 Yes, I wanted to tell you about Graphic Design, however I was really optimizing my site for Sarasota Graphic Design. Ever since I started working online back in 1995, I started working with the concepts of “Search Engine Optimization” or SEO. Yes, I know that Google didn’t launch until well into 2000, however I knew it was going to be hard for people to find your website early on. So, I’ve been working on key ways to help people find your website. One of those key ways is still working today! Content, Graphics and Meta tags. Hence, this story or post. I’ve been working with graphic design and corporate design for over 35 years as a profession. As an independent graphic designer, I’m able to work one on one with my clients to help them get exactly what they might be looking for. This is more cost effective and actually faster. As a media company CEO, I know how hard it is to get a whole team to get something done. Let me tell you it’s much easier getting a cow into a trailer than the whole heard. Working with an single graphic designer is much better than a whole firm. I’ve been here in Sarasota Florida since 2014. I love it and now have made it my home. Please contact me, Scott Prentice if you have any photographic, graphic design or website design needs.